Piftija is a traditional Macedonian dish usually served in winter. This dish when cooled congeals because meat naturally contains gelatin. Each house has its own recipe for piftija and usually recipe never changes. I have to be honest and admit that I don't like piftija, I don't like that jelly structure in my mouth, but I love that smell of garlic mixed with meat. So, basically I only like to smell piftija. 1. Wash pork legs and muscle and place them in a pot of 5-6 liters. Pour cold water to cover and let them boil. While boiling, constantly remove the generated foam so the aspic remains clear. When there's no longer foam formation, add all the other ingredients and cook covered with a lid on a low heat for 4-5 hours. It's done when the content in the pot decreased by 1/3 to 1/2 and the liquid becomes sticky. If you are unsure, take 2-3 tablespoons of the aspic, place in a small bowl and leave in the refrigerator. It needs to gel quickly. 2. Move the meat on the side. Remove the vegetables and discard them. Strain liquid through fine sieve in a wider bowl. Let it settle. Collect all the grease from the surface with a spoon so there won't be any white spots on top. 3. Once again strain the liquid through the same sieve, but this time put on the sieve a filter paper or a rougher paper towel. Piftija will be crystal clear this way. Add salt if needed and add smashed garlic if desired (I highly recommend adding garlic). 4. Remove the meat from the pork legs, remove all membranes and tendons from the muscle and cut into pieces. 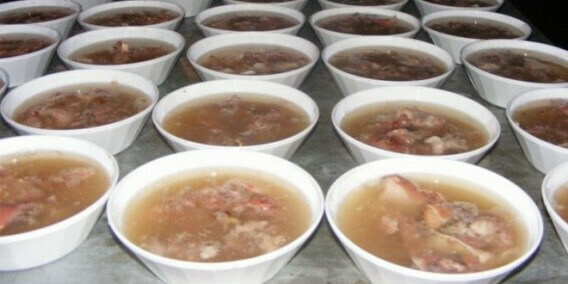 Arrange the meat in one or more deep plates according to your needs and pour the liquid. Leave to harden in the fridge. Serve as an appetizer for your guests or your family.